An easy route with good footing, the farm track also offers good views. Its elevated view point allows you to look over the fields, meadows, and woodlands below the track, and the heather-covered hills above. 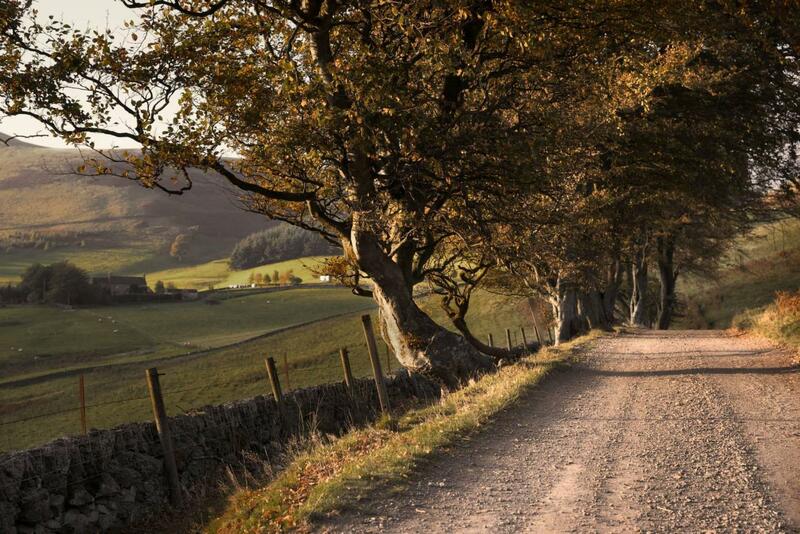 Walk down along the Beech-lined tree avenue and emerge to a spectacular panorama of the valley below. An Iron Age fort stands on the hill beyond and the Moorfoots Hills can be seen on the horizon. From the cottages walk out of the farmyard and past the stables. Follow the track up a slight incline. Even from this point, the views down the valley open up & you can see the patchwork of fields & woodlands bound by stone walls or "dykes". Follow the track as it swings right along the wall. At the end of a straight section of road the, the ground above the track opens out to the hill pasture. It is teeming with old-fashioned grasses, herbs, wild flowers, heather, and bracken. In the summer the banks are teaming with wildflowers. Our herd of Scottish blackface sheep graze free-range throughout the farm. On the lower side of the road a wildflower meadow, wetland area, and woodlands team with wildlife. Brown hares are everywhere. There are many badger setts on the farm, and peregrines and ravens can often be spotted on the wing. 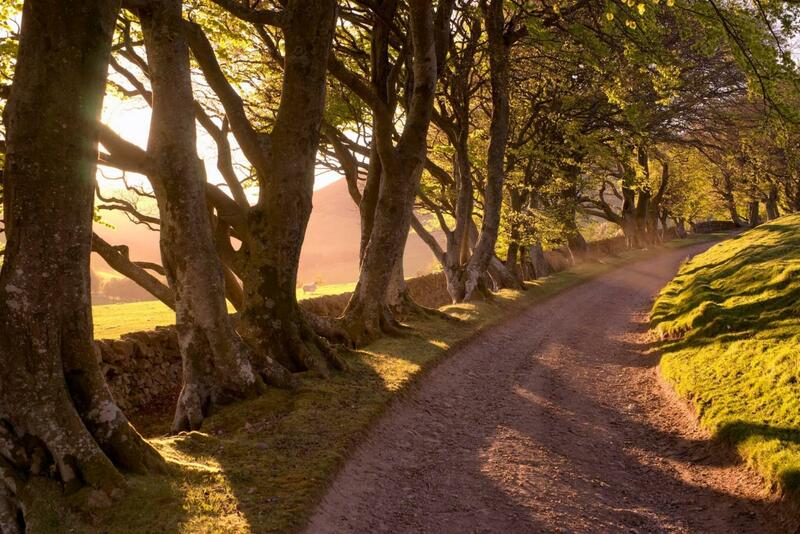 Follow the road down through the old beech trees casting dappled shade on sunny days. When you reach the end of the old beech trees and past the last ancient hawthorn at the trackside, the view opens out over the wide valley to the Moorfoot Hills in the distance. The nearest hill in foreground has the remains of an Iron Age fort. This is a good point to turn back & retrace your steps. See the landscape afresh from a different perspective on the way home.